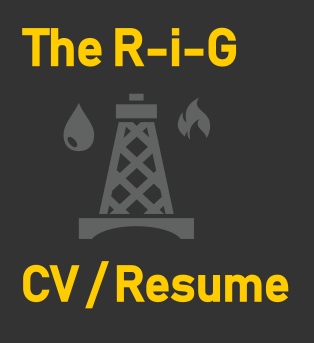 New: the "R-i-G" CV / Resume - Use it to Make Yourself Stand Out. Free. And then you remember you forgot to add that one Health & Safety course you did, so you add it. And by adding one line more, you now need another page! Ugh!! The result? Your CV or resume is just kind of awkward and average. You don’t want that. So I’ve created the R-i-G CV concept to help you. R. It stands for “Regular”. This is boring. But critically important. You have to include in the CV: the REGULAR detail! What is that? It’s the stuff that has to make several people and MACHINES happy. Whether an HR person, a recruiter or an applicant tracking software system (the “machines”), your Oil and Gas CV has to provide the detail that satisfies their needs. They want to see what they want, where they want it. Otherwise they will toss you out. So here’s the list – you have to make sure these details are included, labelled and easy to see and find. DO NOT SKIP THIS STEP! You may want to. Resist the urge. Spend time on this. Look at a typical job ad you want to apply for. Then review the content of your CV. Let’s demonstrate. Now, after studying the advert, and understanding what the requirements are… double check that you have all of “REGULAR” details included to match the needs. Don’t include long bulleted lists of ‘duties’ – keep it short, to the point. And for the machines… keep your job title to a common title (the same as the jobs you’re applying for!) and use the same words and terms that appear in job ads you’re applying for. Scan the job ad again and again. Identify the most important skills and requirements mentioned. Make sure they’re in your Oil & Gas CV, multiple times (but not in an unnatural or artificial way, okay?) Make sure your CV reflects what the advert is asking for. Here’s my version of what the keywords are that should be highlighted in YOUR CV (only if you’re a Welding Manager, of course!) The keywords are in bold. In your CV, those keywords, including acronyms such as “NDE” (non-destructive evaluation / testing), really need to be featured strongly, they must stand out. Why? They will be searched for by recruiters. You want them to see it featured in your CV. So check that you focus on these. And stick to traditional headings, such as “Education”. Simple, easy to understand, even for software! This first point (“R”) may seem obvious. But double check it. View your CV as a recruiter would. Give it just a few seconds. Scan it over. What stands out? Do you look immediately like a good person for the job? You should. Your “REGULAR” detail must be complete and easy to find. It must be ‘tuned’ to match the job ad. Recruiters don’t like reviewing CVs! Remember that. So if you go out of your way to make your CV more interesting, it’s a good thing. And when I say “interesting”, I don’t mean meaningless ‘bells and whistles’, or anything fancy. I mean adding detail that helps the reader see you’re great for the position! And doing it in a way that’s noticeable, catches their attention and is… you guessed… interesting! There are many ways to do this, but here are a few of my favorite that you can easily use in your Oil & Gas CV to transform it in the direction of making it a R-i-G CV. Short, sharp, keyword optimised and a confident statement to answer the question! Effective! Makes an impact both with people and ‘the machines’! 2. Include examples of projects: demonstrate – show! – your work. Use this proven format: project name (and company), project location and environment, value of project (if you have the $ value), give some statistics (number of people, vessels, containers, miles offshore – numbers are interesting), describe the project in a sentence, list your role, describe the challenge the work presented, how you overcame it and the result achieved. Project Delta Phoenix, Chevron, 2016, off Nigeria coastline, USD200M value project with 200 skilled tradesman and 500 labourers. As Welding Manager led a team of 30 Welders restoring aged oil rig / platform. Despite unseasonal bad weather, high winds, pushed the team and successfully completed project in 5 months, within 1 week of deadline. See how that provides a ‘picture’ of your work. It’s interesting! More readable. 3. Leave out “Achievements”, include “Notes”. Normally you’d include an “Achievements” section. But that’s become stale. And recruiters know that this is the section where you will try to impress, state all your ‘incredible’ exploits and heroic acts on behalf the company! So they don’t take it that seriously. You DO, however, need a place to list important (and interesting!) information. or how you trained up local workers and left skills behind! This is interesting stuff. It captures attention. Is good to read. And it presents you in a positive light. So far we’ve covered how you need to 1) provide on-point information, providing the regular data clearly, unmistakably; and 2) made your CV interesting; and now we have to: 3) make them trust you. How do you make people trust you? And it’s vital. For someone to hire you they have to believe you’re credible, skilled. They have to trust that you have what they need. That you’ll do a great job. They must trust that you’ll get along with their team and ‘produce the goods’. Here are a few ideas of how to generate the trust you need in your Oil & Gas CV / resume. Get the basics right – follow the template provided above and in my “CV Writing for the Oil & Gas Industry” article. Use the Oil & Gas resume template (you’ll see it on that page). Check your spelling. Use okay grammar (no-one expects you to be Shakespeare!) Include the right information. Be specific: name names, include statistics, provide values, show that you measured your work, make sure your dates are correct. Be concise. Put the work in to make it all quite short and punchy. Use straight lines, proper formatting for the CV. For example, often I see my clients’ resumes and for example, they’ve used spaces to position words – instead of tabs for that purpose. As a result the CV looks messy and unprofessional. It doesn’t encourage trust. Get someone you know who has some word processing skills to get this sorted. My template makes it easier too. Include successful projects – we’ve already done this, above, but make sure you do it. Finish off with 3 or 4 of these. It builds trust. Puts you in a positive light. It sells you. Make sure then that your job application for Oil & Gas, oil field, petrochemical technical type jobs is with a R-i-G CV or resume. It means you’ll be doing it right. You won’t get every job you apply for… not ever. And you’re dealing with recruiters who receive 1,000’s of applications every week and “The Machines” who don’t care about you, they’re clinical, they look only for keywords and good structure and quality of your CV. And if you need my personal help with your CV – if you find yourself getting stuck, or struggling to figure it all out or ‘spin-doctoring’ your own unique situation, send me an email, perhaps I can help with some advice or a ‘done for you’ resume writing service.